For a long time, many American educators and educational stakeholders have drawn their ideas for educational reforms from ideas generated in Europe and Asia for the changing demographics of America's diverse classrooms. 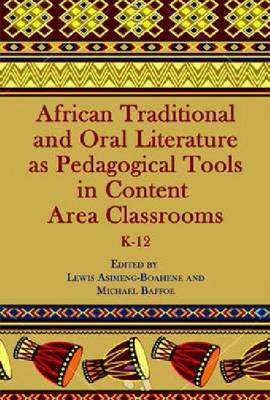 This book is therefore motivated by a bold attempt at advocating for the revision of existing pedagogic fora and the creation and addition of new fora that would provide for the inclusion of thoughts, perspectives and practices of African traditional oral literature in the pedagogical tools of content area classrooms especially in North America. The articles that are presented in this book provide theoretical frameworks for using African traditional oral literature and its various tenets as teaching tools. They bring together new voices of how African literature could be used as helpful tool in classrooms. Rationale for agitating for its use as ideal for pedagogic tool is the recurrent theme throughout the various articles presented. The book explores how educators, literacy educators, learners, activists, policy makers, and curriculum developers can utilize the powerful, yet untapped gem of African oral literature as pedagogical tools in content area classrooms to help expand educators repertoire of understanding beyond the `conventional wisdom' of their pedagogic creed. It is a comprehensive work of experienced and diverse scholars, academicians, and educators who have expertise in multicultural education, traditional oral literature, urban education, children's literature and culturally responsive pedagogy that have become the focus of U.S. discourses in public education and teacher preparation. This anthology serves as part of the quest for multiple views about our `global village', emphasizing the importance of linking the idea of diverse knowledge with realities of global trends and development. Consequently, the goal and the basic thrust of this anthology is to negotiate for space for non-mainstream epistemology to share the pedagogical floor with the mainstream template, to foster alternative vision of reality for other knowledge production in the academic domain. The uniqueness of this collection is the idea of bringing the content and the pedagogy of most of the genres of African oral arts under one umbrella and thereby offering a practical acquaintance and appreciation with different African cultures. It therefore introduces the world of African mind and thoughts to the readers. In summary, this anthology presents an academic area which is now gaining its long overdue recognition in the academia.